The interior lining or insulation was a very high tech product in the 1970 made from a closed cell foam called ensolite laminated to a tough vinyl outer layer, it is often called Elephant Skin. Both the lining and the fiberglass cabinets are extremely durable, most standard cleaners will work without causing any harm with one exception. It is always best to try to clean the vinyl surface first, often any staining and discoloration can be removed leaving a clean soft white interior. The non-painted surface will be easier to clean and maintain, on badly discolored walls some people have had success using Spray 9, Simple Green or even a Magic Eraser, but if all your attempts fail you can always paint the interior. I carefully researched and tested the following method and it has stood up very well over the years. DO NOT USE HOUSEHOLD CLEANERS ON THE FRONT & REAR WINDOWS, you will permanently damage the window surface (see section on Windows – Care & Cleaning). The tape used on the seams of the elephant skin was actually a two sided foam tape that talcum powder was applied to the outer side, often this tape is either missing or falling off. Finding a replacement tape that will actually stick and stay stuck is difficult to find, my recommendation is to apply a paintable latex caulking to the seam gap, you can blend this to almost make the seams disappear. 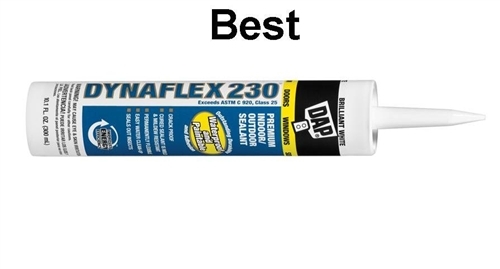 The product I used was DAP Dynaflex 230, which is and indoor outdoor caulking that is incredibly easy to work with and offers a 50-year satisfaction guarantee (and it cleans up with water if you make a mistake, that is until it dries). To apply I recommend making two coats, the first one fill in most of the seam, the second coat fills to final level and can be textured. First clean the area using the cleaning instructions below in the “Painting the Inside” section and allow to dry, apply the caulking sparingly using a caulking gun, forcing it into the seam gaps with a small plastic putty knife or your fingers leaving s slight depression along the seam, clean up any ridges or mistakes immediately before it sets. After the first coat sets there will probably be some shrinkage, apply a second coat with a wider plastic scraper or putty knife (use plastic as I found metal tools left dark marks on the lining), let the caulking set-up some testing areas with your finger to where the surface is skimmed over but can still be shaped. Using a sponge lightly press on the line to apply a texture, you will find it will look very close to the rest of the lining. After it is fully cured you can paint the entire interior, it will look like new. After a lot of research on the interior Elephant skin lining and trying to get the surface clean and white I came to the conclusion painting was the only alternative. Researching paint I found some very interesting information. First was surface preparation, I have always used trisodium phosphate (TSP) as a cleaner but discovered that many paint manufacturers will VOID their warranty if it is used. The reason appears to be related to insufficient rinsing which leaves a residue that the paint will not adhere to. The recommended cleaning agent is ammonia and water in a 1:1 ratio. The ammonia water cleaner works very well on oil, grease and stubborn stains, it also does not require rinsing and dries leaving no residue (again DO NOT get this solution on the acrylic front and rear windows). 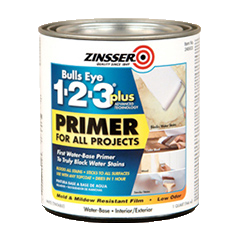 After cleaning the entire interior is primed using a high adhesive primer, I used Zinsser Bulls Eye 1-2-3, this is a Rustoleum product that can be used to prime ceramic tile for painting so it should work. Over the primer use a high quality latex paint, I used Rustoleum Painter’s Touch in gloss white. The paint has currently been on since 2011 and I am extremely pleased with the look and durability at this time. Was out this morning fiber-glassing the support in for the front bunk (old one was rotten). Some of the old paint on the ceiling is peeling off and we are planning on painting the interior anyway so I started peeling the paint back. Woah! Lots of mildew strewn across the ensolite. Not sure if this is because there is a leak between the fiberglass ceiling and ensolite or if it just formed on the outside of the foam and was not cleaned properly before the last person painted it. Regardless I’m now peeling as much of the old paint off as possible so we can spray the interior with ammonia/water (50/50). Then we will repair some of the ensolite that is releasing from the body with foam adhesive and then fill the spaces between the foam sheets with a paintable caulking. Lots of work but we are hoping to have it completed by Easter so we can camp……maybe wishful thinking. Sounds like you are busy Ryan. I am guessing the mold was not cleaned properly to start with, it will not penetrate the ensolite so a good cleaning, there is also a good chance that an oil based enamel was used previously which will trap moisture whereas a latex will breath and any moisture should dry. Best adhesive to use for the ensolite to fiberglass is a good quality contact cement or automotive headliner adhesive used according to manufacturers directions. Consider the temperature extremes your trailer goes through, the adhesive has to be designed for this, it is called “Service Temperature Range” look for a cement with a broad range. Good luck on your project and make sure it is usable for the summer. You want to enjoy camping season. Thanks for the reply Ian. So it’s coming along. I’ve taken your advice and filled all of the gaps with the DAP paintable silicone. Then I used the Zinnser Bull’s Eye 1-2-3 primer after cleaning with ammonia 1:1 (Highly recommended to wear a proper mask even with the door and all the windows cranked open). I didn’t see your reply in time and bought a foamboard adhesive from Rona to stick down any of the ensolite that was peeling back. I used a high quality latex paint (for it’s low toxicity and easy clean up) which we decided to add a very small tinge of black and yellow shade to. We found the white was just too white given the cabinets and other parts have an aged appearance. I’m wondering if anyone has tips on what to paint the cupboards with? I was thinking the Bull’s Eye primer will probably work but I’m not sure what paint to use. Next steps……..clean the inside and hide the wires from the Fantastic Fan. We are looking to camp on Saltspring Island, BC next weekend. I actually painted the fiberglass step (curb) area around the dropped kitchen floor with the same products I used for the ensolite, it worked great, been 2 years now and no peeling, chipping etc, and easy to touch up if needed. I painted the interior of my boler with paint that I can’t even recall what kind. Anyways, only afte one year it has already started peeling. I tried scrubbing it off with no avail and considering redoing the whole inside but I don’t have time. So what should I do? Am I able to repaint over again with the products you suggested? Please let me know. I want a quick fix just for this year cause we are going on a road trip. Unfortunately there is no easy fix for your situation, any paint you put on top of the existing paint is only as good as the bond between the original paint and the wall. I think your best advice could come from your local professional paint supplier (not your local home improvement store, go to a paint supplier the professionals use) I think in the end the only solution will be to use a paint stripping chemical that is compatible with the vinyl surface, this will be a VERY messy job but that way you are sure the paint is applied and stick directly to the vinyl base. When you talk about ‘painting the inside’ is this directly on the fibreglass you are referring to or onto the elephant skin? When I got my Surfside eight or so years ago, the guy I bought it from told me I had to use marine paint for the interior. This I did, and it seems to be standing up quite well. Very “heady” during the painting/drying stage, though! You definitely need a well-ventilated area and maybe even good mask! For the fiberglass items marine paint would be the best, thank you for the tip. These instructions are mainly focused on how to paint the vinyl cover ensolite wall insulation/covering. There are very few products better for painting fiberglass than Marine topside paint, but on a surface as soft and flexible as the lining I would be afraid of cracking and flaking because of the movement and/or bubbling if moisture were trapped behind it from interior condensation through the back side of the lining. Bought a 1979 13′ and the guy had already stripped the ensolite off ,now i’m trying to clean the glue and pieces of foams that was left left on the walls and ceiling.What a job. Where do you get Ensolite or could you suggest a finish I could put on the fiberglass. Unfortunately the original lining (vinyl coated ensolite) is no longer available. I am also glad you found our site. Dynaflex is easy to work with, it is also very forgiving because if you make a mistake or a mess you can clean it up with water, as long as it has not dried. For the screws, yes you could just go over the point with Dynaflex, you could grind the point off with a Dremel tool and a small grinding wheel, or you could replace the screws with either shorted screws, pop rivets, or machine screws (small bolts). To get a smooth finish you could use a high build primer over the wood, may take several coats, sand this to a smooth finish then paint the finish coat. Talk to your local paint store for their recommendations. Please correct me if I am wrong but I don’t think your 1979 17″ uses the vinyl covered ensolite insulation which is only about 1/8″ think, I think yours uses a coated open cell foam liner that is between 3/4″ to an inch thick and quite soft to the touch. If there are seams in the lining close to where it is separating then carefully pull the seam open to expose the area, apply contact cement to both surfaces (if you have the softer lining use water based contact cement). If there are no seams I would not cut it open, the thicker foam will not join together very well. I would probably use an aerosol adhesive like 3M Super 90 (just make sure is comparable with the foam as some will melt foams & plastic material so teat first). then I would poke a small hole in the lining and using a tube extension spray the adhesive behind the lining. It may take several holes but these should be easy to patch later. you’re right.. I called it the wrong thing. It looks like popcorn but it’s soft and rubbery and thick. I wondered about trying to pump in some silicone calking in case the glue reacts with the rubber .Would that make it stick? I wouldn’t use silicon, it produces awful smell and I just personally hate the stuff. A would still recommend a spray that can be applied through a very small hole yet able to cover a large area on the back side. I have a 1975 trillium fiber glass trailer I want to restore. The interior insulation (elephant skin) had water damage underneath as well at the wood frames of the windows which were falling apart from rotting. I tore out the elephant skin and will replace the wood frames around the windows. I’m wondering if there is another alternative for the interior walls other than the insolite elephant skin and if there is not a better option where to buy it. I can’t seem to find any information on the stuff or how much it costs or how easy/difficult it is to install. Thought about lizardskin insulator and panting over that or even rhino lining the inside walls. But no one seems to have ever done either of those things. Just looking for advice and information on the insulation use orgibinally or other options. Thanks! Although I am no expert with Trillium trailers many of the maintenance and repairs are similar if not identical. The embedded wood frames around the windows rotting are a common problem. For insulation if I were to re-due my Boler I find this product very interesting. Aluthermo Quattro Then cover this with a marine hull liner which is a very stretchy heavier cloth similar to automotive headliner or a fine woven carpet. It is used to line the interiors of boats and is both durable and designed for a moist environment. Although I have never used Aluthermo Quattro the specification look like they would be ideal for use in our fiberglass trailers. Don’t use truck bed liner or similar coatings, these products do not have any insulating properties, it is important to have an insulating inner layer to reduce the amount of condensation which is an ongoing problem with small fiberglass trailers. How did your walls turn out and what did you fix with? I am planning on painting both the fiberglass, the cupboards and the ensolite. From all I read here and elsewhere, I’m planning on using the same primer as you did on all three surfaces. I was planning on using some latex melamin finish paint. I’m sure it will work fine on fiberglass and cupboards. But do you think it’d be too stiff for the ensolite? I have read and seen stories of people ripping everything out before painting: cupboards, fiberglass closet and seats, windows, etc. This is my first camper (1975 Boler) and just want to clean it up to use it and see how we like it. I’m not planning on ripping everything out. Is there something I miss? Yes you can use the same primer on the interior ensolite and fiberglass, on the firberglass you need to prep the surface by sanding to provide a surface the paint will adhere to. You don’t need to remove the cabinets, I specifically don’t recommend removing the closet as it is a structural component and actually fiberglassed in place on the door side. I ran extensive tests on the paint I used on the ensolite, exposing it to temperature extremes, flexing & bending, etc. I cannot comment on the melamine paint you mention, I know most of these products are very durable on interior household surfaces but have no idea how well they will work on the softer surface of the ensolite or the temperature extremes. Most exterior or interior/exterior latex paints have a higher adhesion in temperature and moisture extremes. I would test the product on a small sample of ensolite you could get from inside a cabinet or under the sink. Do you think chalk paint would work on the interior of a Boler? I just bought a 1971 and interior is salmon pink. After using the chalk paint I was going to finish it off with a wax. I don’t know this paint product well so read the instructions and I would even test on an area for how well it holds and flexes, when I tested the products I recommend I tested them for several months in extreme conditions and stretched, twisted and bent the lining to make sure it would hold. What is important is that the paint used is for interior / exterior use and that it is a latex base. The reason for this is the inside of the trailer is exposed to an environment similar to the outside including temperature and humidity extremes. Latex because it “breaths” that is any moisture trapped behind the paint film can escape and dry whereas enamel paints can trap moisture and bubbles and blisters will form resulting in the paint peeling. I want to do a good cleaning of the 1973 Boler we bought. It is pretty dusty especially the cushions. Fingerprints n the ensolite. What is the best product to clean the upholstery and ensolite? The cushion covers are removable and can be cleaned with upholstery cleaners or laundry detergents. Use usual precautions for colour fastness and shrinkage. Hey Ian, I love your site. another note for you. Before you paint the interior you can replace the foam tape with 3m double sided tape. you paint over the exposed sticky side and you are left with a taped seem that matches the original almost perfectly. Good tip Morrgan, what 3M tape are you using? I have not found any tape that will stay stuck except for the 3M VHB tape which is quite costly. I have a 1975 ECO 13 foot trailer. The elephant skin is real sticky. I have put primmer on it twice and the sticky still comes through. I used a latex primmer called Kill’s. Any idea what to do too stop this problem? I just love my little ECO. This one has a toilet in it. What a great thing to have when dry camping. Any idea how many Eco trailers where made in 1975 that had a bathroom? My first question was, what do I do about sticky elephant skin? I have put Kills on twice and it did not stop the sticky problem. I called scamp and they suggested pulling it out and going with there product. Not gonna happen. Any ideas? Hello Jim The Eco was made from moulds supplied by Boler, but I am not sure how many were made. I just acquired a sweet 13 foot 1976 boler. The ensolite was a bit grimy especially around the stove. I used spray nine and a fingernail brush and it cleaned up nicely. I am still considering painting as the seams were spray painted a bright white by the previous owner. My question is: Do I need to prep the walls with the acetone solution after using the spray nine or do you think I can prime directly over this product? Thanks for a great post! Congratulation on owning a Boler. You would not want to use acetone but I would wash the walls very well with a solution of ammonia and water, this will remove any remaining grease, oil and even residue from the spray 9. Then prime and paint as I describe in the article. I dove head first into my boler restro a few years ago, only work on it in winter because were busy using it in the summer! I stripped all the old ensolite off added a foil bubble insulation and now am on the hunt for the hull liner. Any chance you know how much linear feet need to do my 13 ft boler? An ambitious project. I do not know exactly, Looking at the total dimensions that does not exclude any windows or openings you will need about 250 sq/ft. I just bought a 1977 beachcomber, 15′. Are you familiar with them? They were only made for a handful of years I believe. I’m assuming that it’s made with the same interior materials as 70s bolers? I’m located in Saskatchewan, Canada, and it will not be stored in a heated facility over winter, it can get to -40 C at times. How does the temperature extremes compare to yours? Wondering if I follow your advice and use the products you did, if it will be successful. I live in Calgary Alberta so the temperatures are comparable, Calgary may even see more drastic temperature swings whereas Saskatoon probably experiences longer periods of extreme cold. Assuming the interior lining is a vinyl coated ensolite approx 1/8″-3/16″ thick I am confident the procedure and products I recommend will work very well. 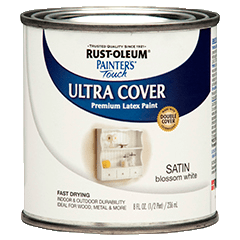 Is the Painters Touch latex tintable? Good question Melody, I am not sure. Best to check with the paint expert at the paint store, they should be able to answer this. Thanks for providing all the great information! We are restoring an 13 foot ’74 Boler. It’s last registration date was 30 years ago! The insurance company thought the old registration was quite interesting to see. Considering the Boler has been outside for years, it is in amazing shape. Dirty, yes, but no mice. We were thinking about changing a number of things; however so much of it can remain original that it may remain that way for now. We were thinking of putting a backsplash up behind the sink and stove area. Any ideas what would be the best material to use? We are also planning to put stainless steel on the hitch side of the Boler to protect if from stones. The previous owner had some type of rubber material on it, we think. It is disintegrated in most areas. How would you remove it without damaging the exterior? For a back splash many use the peel and stick tiles, there are some great options and they seem to stick very well, just clean the ensolite well to make sure there is no grease. The rubber on the front may have been original, this rubber floor mat was standard on some models, to protect the front you could use stainless steel (although it is heavy and expensive, aluminum checker plate, a common solution is spray on truck bed liner, or even a tongue box (like I use) works to protect the front. Removing the rubber is a PITA, I had it on my Boler and it appeared to be attached with a carpet adhesive, I used a heat gun (carefully) then solvents to clean off the glue residue. our trailer. We were thinking of taking off the material, but perhaps cleaning and painting sounds easier. Any suggestions would be greatly appreciated. Thank you. Debbie in Emma Lake, Saskatchewan. I believe Surfside uses a similar lining. I would definitely try to clean it first, only paint if absolutely necessary. You can use almost any household cleaner on these interiors, do test in a small hidden area but I hear of excellent results from Spray 9, Magic Eraser, etc. When you say amonia for cleaning the inside of the trailer what do you mean? Something like sudsy amonia? or is this something else? Hi Karen. Regular ammonia (NH3) available at most super markets or home improvement stores. The ammonia I am referring to does not foam so a “sudsy ammonia” would be a cleaner with other ingredients added. We have had a ’76 Boler for about 7 years. Three years ago the interior had a thin layer of black mold in the spring. I cleaned it with a spray product called concrobium mold control. This spring the mold is back! Will the ammonia solution that you recommend kill the mold as well as clean the interior? Also the seams are starting to split. Do I have to remove all of the tape or can I just patch the bad spots with the Dynaflex 230. We will be travelling for 4 months so we want to do anything that needs to be done now in order that our travels can be maintenance free. I checked the MSDS for and it appears the active ingredients are Trisodium phosphate and Sodium Carbonate. Although Ammonia and water have been tested to kill mold a better alternative would be a bleach based product. Mold also needs something to feed on and moisture to survive, there could be some oils of cooking residue on your walls that along with the humidity is supporting the mold growth. Always test any product before using and follow instructions. I would use a bleach based product first, rinse well then wipe down with the ammonia solution. As is pointed out in the next comment DO NOT mix ammonia & bleach, make sure the walls are completey dry and rinsed before hand. You can definitely just patch the seam areas where the tape is missing or loose, it is easy to touch up any seams with the Dynaflex as needed. Hi Ian, thanks for all the information. You’ve answered every question I had. One caution–do not use bleach and ammonia together as it is highly toxic or combustible (I can’t remember which, but just don’t use them together). It’s not advisable to use bleach for cleaning the camper – reacts with the elastomers and rubber inside the vinyl and foams. Will either eat the material or degrade/embrittle it. Noticed this when trying to clean out some spots of mold on my cushions, and read up further on it. I have just purchased a 1979 surf side triple e trailer. Interior elephant skin had to be removed completely. Can I spray the complete interior with a bed truck liner? Although truck bed liner is a very tough and durable coating it does not have any insulating qualities. Fibreglass trailers are very prone to high levels of condensation inside, insulation of some type reduces this considerably, without any insulation or with just the truck bed liner the walls will literally be running with water. I used an oil based paint on the elephant skin where the backsplash is. Will the oil-based paint harm the elephant skin? I plan to put peel and stick tiles on. Should I strip that paint and use the water-based paint you recommended or can I simply stick the tile on top? If I need to strip it, what should I use? The reason I recommend latex paints are because they breath, any moisture that manages to get behind the paint can evaporate through the paint, where most oil based paint forms a moisture proof barrier, if any moisture gets behind it the result is usually blistering and peeling. The actual paint will not harm the ensolite. In your case I would leave it and only consider stripping if a problem occurs sometime in the future. Hi Ian. Good to know about using latex instead of oil based for the breathable factor, I’ve noticed some bubbling on my boler and I’m guessing that is why. I do like the idea of having a little extra insulation on the inside and using that reflective foil with headliner fabric but I do have a few questions. Would I need to worry about moisture between the fiberglass wall and the foil, if I do get condensation then I would have to worry about the water pooling on the floor. Also, would it be better to strip off the ensolite first or do you think I could just glue the foil right over the ensolite? Any advice would help, thanks!! What do you advise using to get the residue from the foam tape’s adhesive off the elephant skin? I tried using Goo Gone to no avail. hey Ian…..just finished cleaning the ensolite with tsp….then read this…oops. I’m planning on repainting so what if I just give another quick once over with the ammonia and water solution? Yes, rinse really well and you should be fine. Hi Ian, I’m not sure if my interior insulation is ensolite, it’s the stipple style( popcorn) type. Do you think I can follow the same cleaning painting instructions as with the smooth elephant style? Thanks Marc, great site by the way! I would really try to clean it first but if you have to paint, yes you should be able to use the same process I describe. The primer is designed to be used on ceramic tile and the top coat is very flexible. Your price is great but fixing the interior paint will be a little challenging. I would start with trying a solvent like acetone (work with good ventilation and I would recommend an organic respirator). If that does not work you could try a citric paint stripper but test an area first, then only do a small area at a time and rinse really really well. Hi, just purchased my 1974 Boler. It was sitting under a tree for 10 years. Thank you for the wonderful information, I’m eager to start working on this beauty. I have a 1978 13 foot boler. My son and I have been restoring it. I have painted the ensolite with the recommended paint. Now to paint the fibreglass lower portion inside. What grit of sand paper is needed to scuff up the fibreglass? And will I need to use a primer also? Or two coats of the paint. Hi Nancy, prep the fibreglass surface by sanding with 220 grit sandpaper, this will provide a surface the paint can grip to yet will not show any sanding marks in the finish. Follow the instructions on the paint you select, most will recommend a primer first to enhance the paint adhesion, but some newer paints may not require the primer.